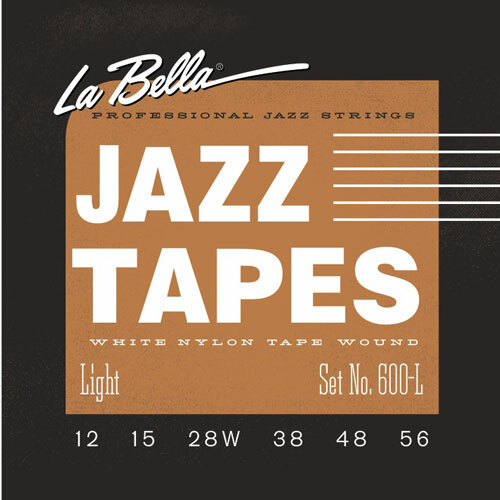 La Bella Jazz Tapes® are the secret behind the sound of the best professional jazz players in the world. These strings are handcrafted with a brand new proprietary clear nylon tape, wound on a hexagonal core. The result is an even smoother-to-the-touch string with brighter tone and clarity than our original black nylon tape wounds. These professional Jazz Guitar Strings are made to fit archtops and hollow-body guitars, therefore are NOT suitable for standard solid body guitars with 25.5” or 24.75” scale like a Stratocaster or Les Paul model. "Why can't I use this set on a guitar with a standard scale?" These strings are really long because they are made to fit jazz guitars that have tailpieces. The strings are 36" from ball-end to silk. The silk should clear the nut and only the silk should wrap around the tuning post. You can wrap the tape wound portion around the tuning post, but if the string is too long, you will have to leave the excess tape wound portion of the string on the guitar because you cannot cut the nylon. You can only cut the silk. If you cut the nylon, the string will unravel. Note that not all jazz guitars have tailpieces, so make sure you measure the distance on your guitar from where the ball-end is located to 1/4" past the nut. If that distance is around 36", then these tape wound sets will fit your guitar. These are too flexible to play vigorously, and too bright sounding for my main archtop. They seem a bit more useful on my darker sounding and less responsive guitar. Adjusting string height makes a difference... too high and they stretch too much to intonate properly when fretted. Too low and they buzz (more than typical flats). Either way, these require a light touch, which is good for some styles but not all. Going to try the black, 14 guage set next. This is the string set of choice for my jazz guitars! My bassist brother was using La Bella White Nylon Tape strings, and suggested that I try the electric guitar version. Although I found the set of 10’s a bit light for my taste, the 12-56 guage is peerless, in my opinion! Brimming full of natural tone, soft and flexible enough for reasonable string bends, nonetheless comfortably substantive for strumming jazz standards. This is a match made in heaven for my hollow body Gibson L-4CES. Thanks for the opportunity to share a positive experience. The construction of the strings is fine. The problem is with the gauges. The wound strings are so slinky compared to the B and E that they should have been matched to maybe a 10 E string. They certainly don't match a 12.